Click on the cover image to see a larger version. A masterful abridgement of the 2017 Across Two Novembers, this book preserves the erudition, poignancy, and occasional quirkiness of the original. It cuts out the lengthy bibliography and some of the daily journal entries, but one is never left wondering what might be missing when a day is skipped. Mentions and fine reviews of dozens of books share the stage with the more personal details. I wanted to craft a love letter, a valentine, to books, and to tell you a bit about me and my world. I suspect that I wrote this journal to make sense of my life, asking what would happen next. Would I leave anything as a legacy when I'm gone? "Thank you, David Faucheux, for your spirit and tenacity, your lovely writing, and this inspiring journal." Links to purchase the e-book edition at other online bookstores will be added here as they become available. Links to purchase the print edition at other online bookstores will be added here as they become available. Friends and family. Restaurants and recipes. Hobbies and history. TV programs the author loved when he could still see and music he enjoys. The schools he attended and the two degrees he attained. The career that eluded him and the physical problems that challenge him. And books, books, books: over 200 of them quoted from or reviewed. All in all, an astonishing work of erudition and remembrance. "Audiobooks take me places and show me things I would otherwise never get to encounter. They see for me by their descriptions, their vivid word pictures, and lyrical prose. They befriend me when I'm lonely, educate me when I'm curious, and amuse me when I'm in a blue mood. I have always known I could pick up a book and for a time be in a better or at least a different place. Books don't judge, ignore, or marginalize us. According to Henry Petroski, author of The Book on the Bookshelf, 'Books spend a lot of time on bookshelves, hanging around near the curb, as it were, waiting for someone to come along with an idea for something to do.' The many voices of these books become almost friends as they spin tales of intrigue, mystery, and adventure in places near and far across time. 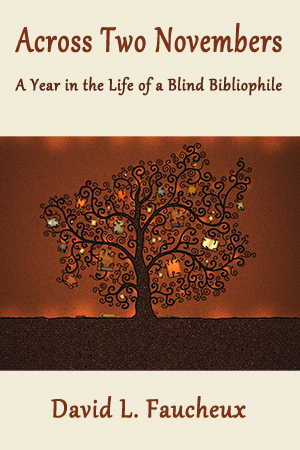 Desiring to share my love of books with a wider audience, I wrote and self-published the memoir Across Two Novembers: A Year in the Life of a Blind Bibliophile." Across Two Novembers was edited by Leonore H. Dvorkin. Cover design by David Dvorkin. "It may seem that I have mentioned books inordinately frequently. Please remember that I take in little television and few movies, and that I don't work at present. It is this amount of found time that I can dedicate to the printed—or in my case the spoken—word. These books are like signposts that help me navigate my way through the hours of each day. I simply wanted to craft a love letter, a valentine, to books, and to tell you a bit about me and my world. I suspect that I wrote this journal to make sense of my life, asking what would happen next. Would I leave anything as a legacy when I'm gone?" To read the book's bibliography in PDF format, please click here. To read the book's webliography in PDF format, please click here. David L. Faucheux is a lifelong resident of Louisiana and currently lives in Lafayette. He attended Louisiana State University in Baton Rouge, where he obtained a BA in English and later a Master of Library and Information Science. He has worked as a braille instructor and medical transcriptionist. With the encouragement of a friend, he began an audioblog, which he maintained for several years. He continues as a reviewer of audiobooks for Library Journal. His hobbies include dining out, listening to music, and learning new trivia. I'm thrilled to honor David Faucheux as the 2018 Audiobook Reviewer of the Year. David has an incredible enthusiasm for a wide range of genres and topics and never ceases to want to learn more and improve his writing. In addition, as LJ's only visually impaired audiobook reviewer, David's feedback on the user experience of various platforms, formats, and recordings is unique and invaluable. Blind author David L Faucheux comes to tell us about his new book called Across Two Novembers: A Year in the Life of a Blind Bibliophile. He'll also tell us about his life. To listen to this week's "Speaking Out for the Blind," go to http://acbradio.org/mainstream and choose one of the links under the headings "Listen to ACB Radio Mainstream" and "Now Playing." Or call 712-775-4808, and when prompted, press "1" for ACB Radio Mainstream. You may also listen to the program live on the ACB Link mobile app. For more information, go to http://link.acb.org. On Monday, January 15, 2018, David was a guest on the podcast "A Book and a Chat." To listen to the interview, first click here to go to the podcast's website. Then click on the link labeled "Link To Podcast." On December 26, 2017, David was a guest on Baton Rouge, Louisiana radio station WRKF. The program was "Talk Louisiana," with Jim Engster. The entire program lasts 45 minutes, and David is the first guest, speaking for 12 minutes. Mr. Engster is a first-rate interviewer, asking excellent and varied questions. The other guests on the show were Jeff Rossen, Charles Duhigg, and Post writer Sally Quinn. On December 1, 2017, David was a guest on a broadcast of Fiction, Old and New. To listen to the interview, click here. On November 9, 2017, Library Journal published an interview with David. To read the interview, click here. 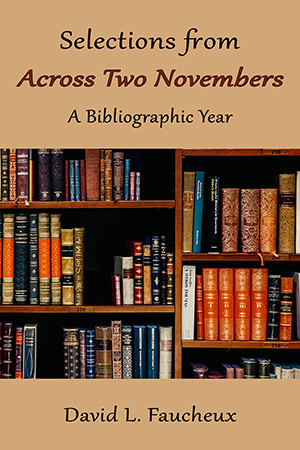 On October 31, 2017, a review of Across Two Novembers was published on a Facebook page for librarians and library workers. To read the review, click here. On October 31, 2017, The Georgetown Dish, a newspaper in the Washington DC area, published a review titled "'Across Two Novembers': The Diary of a Blind Pepys." To read the review, click here. On Friday, October 6th, Fiction, Old and New discussed Across Two Novembers in the Book Nook Room of Accessibleworld.org. On September 29, 2017, Learning Ally posted an interview with David. Learning Ally describes itself as "a national non-profit dedicated to helping students with print disabilities, including blindness, visual impairment and dyslexia." To read the interview, click here. On September 20, 2017, David was interviewed by Lisa Haselton on her award-winning blog. To read the interview, click here. On September 13, 2017, David was interviewed on radio station KRVS. To listen to the interview, click here. During September and October 2017, David was engaged in a virtual blog tour. Below are the dates and blogs. Each blog's name is a link to that blog. On September 3, 2017, David was interviewed for the second time on Jim Brown's Common Sense radio program. To listen to the interview, click here. The interview begins almost halfway through the hour, at the 27 minutes and 33 seconds mark. On August 17, 2017, David did an interview on The Indie View. To read the interview, click here. In July 2017, David was interviewed on the Lafayette Food Junkie radio program. To listen to the interview, click here. On July 16, 2017, David was interviewed on Jim Brown's Common Sense radio program. To listen to the interview, click here. The interview begins about three-fourths of the way through, at the 41 minutes and 30 seconds mark. On June 5th, 2017, David was interviewed on the Branco Broadcast program. To listen to the interview, click here. In February 2017, Breanna Molloy did a human-interest story about David on KATC, an ABC affiliate station in Denham Springs, Louisiana. To watch the story, click here. Deborah Kendrick, a well-known freelance writer, columnist, and advocate for blind people, wrote a long and favorable review on AccessWorld, part of the American Foundation for the Blind. She writes, "Across Two Novembers struck me as the most genuine depiction of life from the blind side that I have read." From the very beginning of Faucheux's book, with its touching dedication to the author's guide dog, Nader, who once "helped chase away some of life's aloneness," to the very end of this one-year journal, readers will find their emotions stretched and eyes opened to what life is like for a person without sight. Superbly written, Faucheux's account details the daily ups and downs he faces as a blind man with honesty, insight—and oftentimes, a delightful dose of humor. I felt his frustration waiting for the Paratransit van to arrive, understood his fear of being stranded, and empathized with the instances where he found himself alone or disoriented. All is not grim, however—not by a long shot. Faucheux loves getting together with his family and friends, enjoys lectures like the ones on Henry VIII at the library, and is always game to try a new hobby or craft that can occupy his hands while listening to a book or podcast. Throughout his journal, Faucheux also delights readers with a stream of trivia and colorful commentary on his favorite meals, often those from a popular local Thai restaurant, or the Cajun dishes, like cracker custard and pralines, made by his grandmother, or those cooked by a blind neighbor, including her cabbage casserole and corn maque choux, which Faucheux instructs is pronounced "mock shoe." Despite enormous challenges, Faucheux has conquered technology on many fronts, and his many book reviews, included in the book, are full of brightly written and insightful comments. The quotes he sprinkles throughout his journal are stellar, including this one from Way of the Peaceful Warrior: A Book That Changes Lives, by Dan Millman: "The secret of change is to focus all of your energy, not on fighting the old, but on building the new." Thank you, David Faucheux, for your spirit and tenacity, your lovely writing, and this inspiring journal. Priscilla Cummings, author of 23 children's books, including the young adult novels Blindsided, A Face First, and the Red Kayak series. I love reading memoirs and journals because through them I get to enter the worlds of interesting people. David Faucheux's Across Two Novembers is no exception. He calls himself a blind bibliophile, to which I'd add foodie and local lore aficionado. Because of his disabilities, his life might seem circumscribed to some. He has chosen to go deep, read widely, and bloom where he's planted. If I had to pick an interesting conversationalist to be stranded on a desert island with, I'd pick David because of his breadth of knowledge. But just skip the desert island and settle in to read Across Two Novembers. Across Two Novembers takes the reader on an incredible journey, exploring the superhighways of such topics as education of the blind and politics, and along the pathways of such things as friendships and good food. The author discusses his blindness with candor and a lack of self-pity. He presents his daily life with its triumphs and frustrations, liberally mixed with his observations of things going on in the world beyond the one in which he lives. Each chapter can be read and enjoyed on its own, thus relieving the boredom that often creeps in when one undertakes to read a lengthy work of nonfiction. It is the kind of book that can be placed on the bedside table to be picked up, digested by sections, and put down again, leaving the reader satisfied, knowing that next time, he or she will find something different on the next day of the author's life. This is a book well worth reading and giving as a gift to the book lovers in your life. Do we dare hope we'll see more from this author? This book is proof that the most mundane events are not boring when they are filtered through an engaging mind and told by an expert storyteller. David Faucheux has an encyclopedic knowledge of the world, and his intellect shines through each sentence. His storytelling gets across that even waiting for buses, cabs, and transit services can turn into potentially earth-shattering events for a blind person. I highly recommend Across Two Novembers to anyone who wants to understand how intellect and determination, and a good sense of humor, can overcome anything. David Faucheux's book has already garnered praise from the disability community; one only needs to direct a browser to his Web page, and an impressive collection of reviews is there for the reading. It is, therefore, this reviewer's intention to state that he is a writer first and foremost; his blindness is part of his overall identity and influences the prose, but it surely does not define who he is and how much he has accomplished thus far. The style is refreshing; the narrative is compelling. Reading about how other blind writers who are word lovers overcome the print barrier is a testament to our adaptability. If you read this book for no other reason than to find out how we embrace literature without the benefit of sight, you won't be disappointed. David Faucheux lost his sight as a teen, but as this memoir of a year in his life makes clear he lost none of his intellectual prowess or powers of observation. Now in his forties, he has earned two degrees and leads an independent life in Louisiana with a wide circle of family and friends. Across Two Novembers runs from late 2013 to late 2014. Faucheux writes about his daily life, a busy mix of cooking and other hobbies, visiting friends and relatives, communicating with a wide range of acquaintances through his computer, and above all, reading. Faucheux enjoys a wide range of reading (using both braille and recorded books) and discusses them in an informal, conversational style which is very appealing. I've already read many of the books he mentions, and have made notes of a number of others that I intend to seek out now that he's told me about them. Those who read Across Two Novembers may pick it up out of curiosity sparked by its subtitle: A Year in the Life of a Blind Bibliophile. As they read they'll find their curiosity will give way to liking and respect for a man who contributes much to our world. Like Reading An Entertaining Column, Day by Day! Readers looking for a literate and friendly voice for a 'visit' now and again will be well-served by this book. The scope of subjects ranges well beyond considerations of 'sight-impairment' and limited mobility. The author is an avid fan of his local NPR station(s) and the breadth of his interests would qualify him as an interesting NPR correspondent. Trivia fans will appreciate his love affair with Jeopardy! If you love the culture of South Western Lousianna, the Layfayette area and its iconic foods are evoked. The author tells quite a bit about ingredients and flavors in his favorite dishes from this multi-cultural area (which, after the fall of Viet Nam, includes a good admixture of Asian influences) but the word 'recipes' is misused in reference to this work. Precise instructions must be found elsewhere. In the end, this is a book for book lovers. Many books are 'called out' from the author's reviews for a major bibliographic list. Many book lovers will recognize our own quirks or quirks akin to our own, in this celebration of intellectual diversity. I also found it to be as important for people with disabilities as the Civil Rights classic, Ralph Ellison's INVISIBLE MAN, proved to be for African American males and writers. Interesting Observations of Life. Simple, Yet Profound. Across Two Novembers is a surprising book. It takes events that the author might consider mundane, and transforms them into delicate commentaries about everything from broad social issues, like how society treats the disabled, down to interesting observations on the local restaurant scene. I found Mr. Faucheux to be a fascinating and compelling writer, with a rare gift for observation along with an uplifting outlook on life that seems to belie his personal circumstances. While I do not throw around comparisons to great works of literature lightly, Across Two Novembers favorably reminds me of the Diary of Samuel Pepys. David Faucheux is also uncommonly well-read, in an age of instant gratification and short attention spans. I greatly enjoyed this book and recommend it without reservation. David L. Faucheux is a totally blind man who loves books with a passion and perceives more than most people can see. He is a man we learn to admire. He reads many audio books, and writes reviews for Library Journal. He has written this very well-written readable book that reads like a novel. It tugs at our hearts and minds as we learn, among much else, about his life, education, triumphs, and frustrations in a sometime humorous fashion. His experiences and successes cause us to realize that we can overcome our problems as he does and enjoy life as he does. He teaches us to focus on our potentialities. He articulates what he understands about life that teaches us. There is so much that we can achieve, but do not do so. He is not like this. He is a university graduate with a BA and is a teacher. His journal is very thoughtful. Each chapter discusses event of a different month from November 2013 to November 2014. He shows us that his life is not circumscribed, but full, deep, and far sighted. Although he does not preach to us, and only intends to tell us about his interesting life, his descriptions challenge us who are non-blind readers to realize that we are missing much that he can sense, life that we could sense as well if we only pay attention as he does, that we should recognize that what some people mistakenly consider mundane events can be a joy. I enjoyed this book for a number of reasons. As someone with multiple disabilities, I'm always interested in learning how people deal with their challenges; this book fascinated me because I learned a lot about David's ability to meet challenges head-on, and proactively cope, and, I am sure, conquer them. He loves being out and about with people, and despite having to wait for vans that don't show up, or are too early, or arrive late, he usually gets where he needs to go, and does what he needs to do. I always breathed a sigh of relief when he got help crossing those wide streets, and I empathized when he got lost and disoriented; I recall how many times that happens to me and other blind people! Yes, this is a book full of book lists, book reviews, and fond memories of books; but what attracted me most were the day-to-day experiences, the ongoing challenges and details about all the stuff we as people with disabilities deal with in this crazy world. Thank you, David, for this book. I will keep it and treasure it, and I hope many others will do the same.